I love Tiffany's more than most but I also ADORE fabulous, pop culture-rich trinkets such as these delish earrings from the Naughty Secretary Club. Want fries with that? Now you can!! 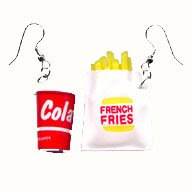 And if you have an appetite for second helpings, you can also get some burger hair clips to complete your look! Jewellery was never so yummy! I can't actually see people wearing these. I like cheap and quirky, but these are going a little far for me.